Being known as the ‘Shopaholic’s Paradise’, Dubai is indeed the hotspot for some of the best buys. Let alone the shops that are seen in and around the city overflowing with buyers, the surge of shopping by Dubaians have also cast a record on the online shopping arena. Well, this article is not going to be about Dubaians or about how awesome shopping in Dubai is. It’s about how to get your business brand and your products in the spotlight worldwide and especially among those online surfers in Dubai. We are going to tell you how Contextual Advertising is going to help your brand hit the right spotlight online. Contextual advertising, as the name suggests, is a form of PPC advertising. Ads that appear on a banner or as a pop-ad on different websites are the ones that fall into this category, but not all such ads are contextual ads. 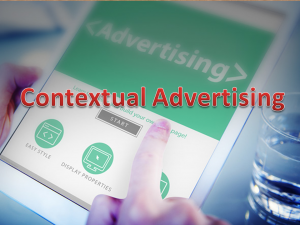 Contextual advertising is all about ads that have a direct correlation with the content of the web page that the user is on and is therefore, also known as ‘in-text’ or ‘in-context’ advertising. So when the users see ads that are relevant to the kind of searches they are performing, chances are high that they will click on these ads, which in turn, is a sure shot way to more conversions. Contextual advertising is all about displaying ads in the places that matter, in places where there is ‘relevance’ for that specific ad. For example, if the user was on a travel page, the pop-ups and banners display different hotel ads, that gives the user an extra reason to stay on the page and if needed, to click on them as well. Therefore, it is by scoring the match between individual ads and the content of the page that these ads become a success. What Goes Behind The Scenes Of Contextual Advertising? So what is the magic that makes it possible to select and display these ads with relevance to the website? To put it simply, contextual ads thrive on scans conducted by several automated systems. Every time a user conducts a search, there will be a set of words that are called keywords. Based on these keywords the automated systems choose and display ads that share the same keywords, or category. Hence, this form of advertising (contextual advertising) is also aimed at delivering the best and the most convenient user experience. When it comes to the system by which Google works on, it basically analyzes the content of each webpage to determine its central theme. This theme is then matched to the ad using the users’ keywords and topic selections, the language and location or, the users’ recent browsing history. This is the principle on which Google AdWords works. It uses contextual targeting when an ad group has keywords or topics and then sets its campaign to show ads on the Display Network. There are also ads that appear based on the location that the user is in. The method used to post such region specific ads based on the user’s location is called Geo-targeting, which is yet another form of contextual advertising. During the process of creating the link between a webpage and the individual ads that appear on the display network, it’s important that the agency that you’re working with does it wisely. It is necessary that your media planners be aware of the fact that with contextual advertising, you get the best of both worlds; exposure, visibility for branding, relevance and performance. Do you feel that your brand is stuck somewhere and hence is going unnoticed? Well, with the best planning and channelizing strategies, our contextual advertisements deliver the most relevant ads to the right audience thus putting your brand in the right spotlight. Give us a call today to discuss how we can support your organizational goals.